There is a new free utility from StarWind software called rPerf. Today we’ll have a look at What is StarWind rPerf Free utility and what are the benefits. rPerf is a free RDMA link benchmarking tool allowing you to effectively measure latency and bandwidth between different systems. The rPerf isn’t a tool with GUI but rather CLI only. This does not take anything from its use as it can give you good and detailed information on the state of RDMA connections not only between the same systems but also between different ones. (Ex. between Windows and Linux). RDMA stands for Remote Direct Memory Access (RDMA) and it is the ability to access (read, write) memory on a remote machine without interrupting the processing of the CPU(s) on that system. RDMA gives network hardware the ability to directly move data from RAM in one machine to RAM in another, without involving the CPU. Usually, a CPU spends a lot of time to manage network transfers, especially for write-intensive workloads (database), which basically has, as a result, slower overall performance. That’s where RDMA (Remote Direct Memory Access) comes in. Note that you’ll need NICs supporting RDMA (Mellanox hardware, ConnectX-3, ConnextX-4…). 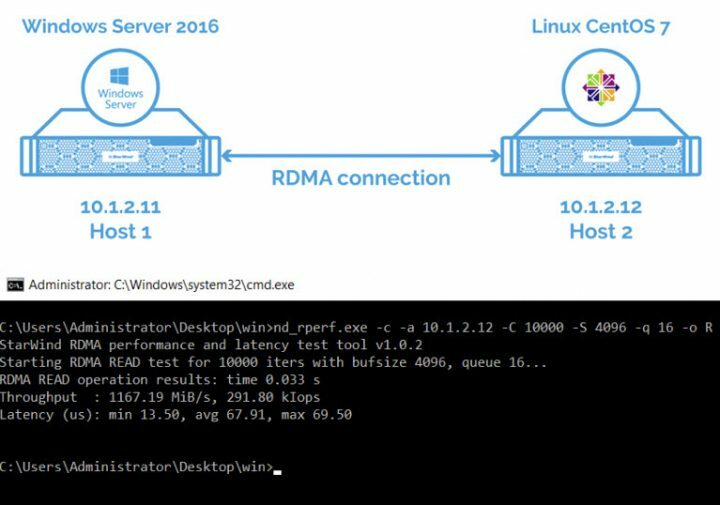 RDMA is supported in-box on the operating systems Linux, Windows, and VMware. The tool can be used on Windows 7 or later version, Windows Server 2012 and later. Concerning Linux distributions, CentOS 7 and Ubuntu are the only supported systems. For Windows-based systems, NIC must have Network Direct Provider v1 and lossless RDMA configured. Latest drivers from NIC manufacturer are recommended, as standard Windows drivers don’t have ND API support. For Linux-based systems, latest network drivers with RDMA and RoCE support are required. rPerf is an all-in-one tool that measures both latency and bandwidth for cross-platform RDMA connections. It is fast and easy to use. One tool provides all the necessary information you require, minimizing your time spent on diagnostics and benchmarks. Few simple commands and you have the job done! There is a full and up-to-date technical documentation here. Examples of utilization can be found in the source document here. And also, you can get a help by pressing the Help button in the StarWind Management Console. Download and Source: StarWind Resource library. In case you don’t know StarWind software you might want to have a look at one of our posts. Did you know that StarWind Software has a free version of their commercial software? Worth to note that StarWind software can be also used in scenarios for on-prem workloads running as a stretched cluster. Both sites are active, so you can run VMs on both locations, perform live migrations etc. StarWind Virtual SAN shared storage is extended between those two sites and used as stretched storage. The cluster is actively replicating the underlying storage so the VMs does not see any difference with traditional shared storage. 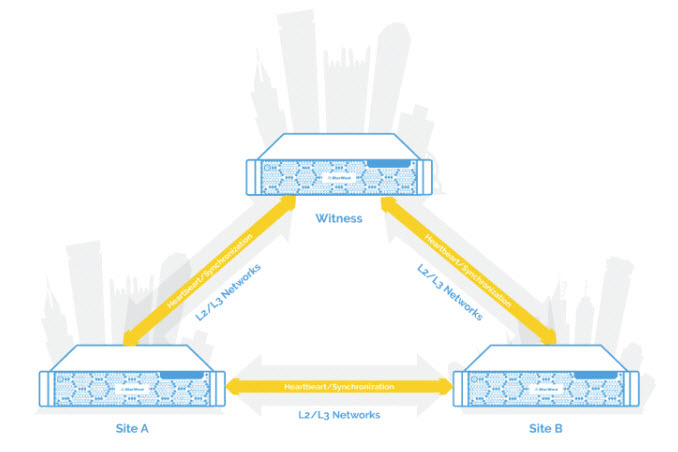 Here we have 2 geographically different sites, where a third site is used for running a Witness, which can run at cloud provider’s datacenter (Amazon AWS, Microsoft Azure or other). Network latency should be minimized. StarWind HA devices continue synchronization process under 100Mbps throughput and latency of 50ms, which allows protecting several mission-critical VMs. However, StarWind is not able to ensure solution stability In case of higher network latency and slower network throughput. In fact, it is highly recommended to contact StarWind support team so that our Engineer could help you with the configuration and confirm the setup. StarWind Software can provide Shared storage for Microsoft Hyper-v, VMware or KVM. You could also just use FIO without all the limitations this tool seems have.